Nearly three-fourths of all nonprofit contributions are made by people who are drawn to particular causes, organizations, and missions. Asking individuals for donations is one of the most common fundraising strategies used by nonprofits. There is a tax incentive attached to charitable giving. Donors feel good knowing that they helped others. There are many ways to donate to causes that individuals care about. Learn how to ask individuals for donations. Corporations often have their own existing corporate social responsibility (CSR) initiatives. They might have limitations on the types of nonprofits that they donate to or have a cap on the amount that they give to charities each year. Companies can expand their CSR initiatives. Businesses appear more philanthropic in the eyes of consumers. Corporations receive a tax benefit. Learn how to ask corporations for donations. Foundations are charitable organizations that issue grants to nonprofits based on mission, location, or size. Sometimes, a foundation will award a grant to a particular nonprofit, or a nonprofit can submit an annual grant requests to receive grants. Foundations form healthy relationships with nonprofits. Grants can directly impact a specific cause or community. Foundations receive more public recognition. Learn how to ask foundations for donations. Asking for contributions in person can’t be used for every single donation appeal. Face-to-face meetings are usually more extended, so they can be the perfect opportunity to lay out your organization’s mission and particular projects that need funding. Because you’re able to interact with a prospect in person, you can better gauge their interests and concerns. Asking in person also adds a personal touch to your donation appeals, which leads to a more compelling pitch and deeper donor relationships. Form an initial relationship with the donor. Be prepared to adjust your ask amount. Learn how to ask for donations in person. 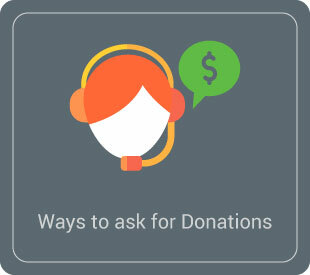 Most people associate phonathons with asking for donations over the phone. But you can use phone calls for everyday fundraising, too. If your organization doesn’t have the time or resources to go and visit hundreds or thousands of people, asking for contributions over the phone can be a great alternative. Asking for donations over the phone still gives you the personal touch that comes with asking in person, but it’s easier and more cost effective than in-person meetings. Give donors a compelling reason to donate. Don’t feel tied to your script. Listen to the person on the other end of the line. Learn how to ask for donations over the phone. There are over 1 billion Facebook users worldwide. At least a few of your donors are likely included in that billion. As long as you’re posting regular content alongside your donation appeals, you can bring in donations simply by asking for them on Facebook. It’s a platform that your donors access nearly every day, so they’re far more likely to see a donation appeal status while scrolling through their newsfeeds. Asking for donations on Facebook can be a quick and inexpensive way to reach a large crowd and directly point them to your online donation form. Start posting regular content (not just appeals). Add a donation tab to your page. Post status updates with a link to your donation page. 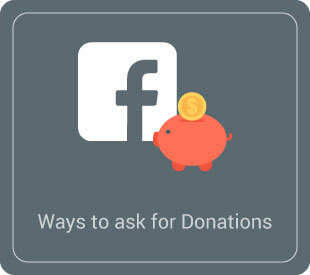 Learn how to ask for donations on Facebook. Donation letters are most commonly used for formal fundraising appeals to companies, businesses, and foundations. However, you can also use letters to reach out to your more traditional donors who don’t have social media or email accounts. You may find these donors appreciate an old-fashioned approach and feel it’s more personal, which could lead to more donations. Because you have time to organize your thoughts before talking to donors, letters can be a great way to perfectly spell out your organization’s need and demonstrate how much more money you require to reach your goal. Tell a story in the body. Don’t forget the return envelope. 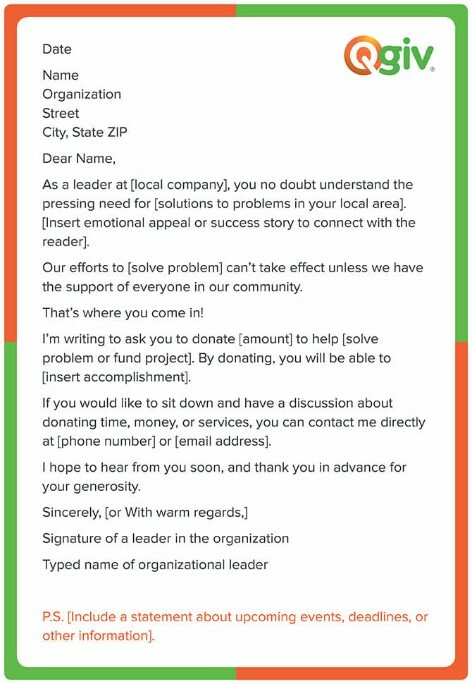 Learn how to ask for donations with letters. 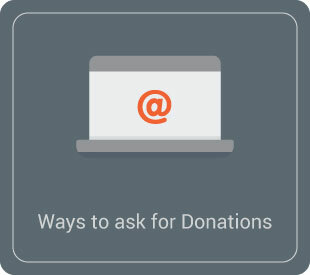 Emails are one of the most common ways for nonprofits to ask donors for contributions. 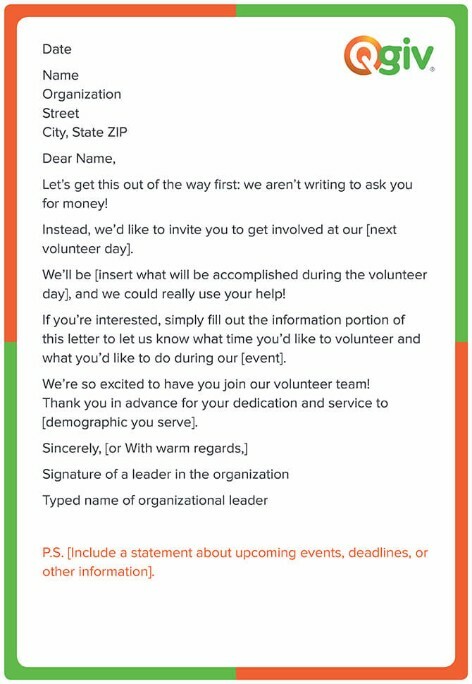 Most nonprofits send out emails regularly (once a week or bi-monthly) and send donation appeals alongside organizational updates and event invitations. Emails are read on laptops, desktops, and mobile devices. This means that your nonprofit has the chance to reach donors nearly everywhere. Sending out emails is also efficient and cost-effective, enabling your organization to reach more people at a lower cost than other methods. Create a bold subject line. Make the ask near the beginning. Explain and describe why you’re asking for a donation. Include links to your online donation page and contact info for donors who want to give by mail or phone. 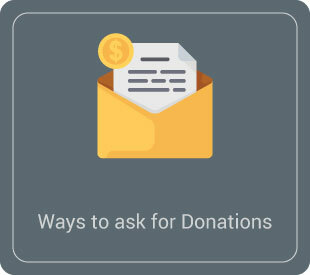 Learn how to ask for donations with emails. The end of the calendar year (November-December) sees a huge spike in charitable giving. In fact, 30% of all annual donations are made in December alone! The end of the year is the perfect time for nonprofits to start ramping up their fundraising efforts by asking for donations. Many of the causes that nonprofits champion have a special day, week, or month associated with them. For instance, Breast Cancer Awareness Month is October, and National Adoption Month is in November. If your nonprofit has a specific “Cause Month,” use that time to amplify your fundraising efforts. Giving Tuesday is a special day of fundraising that started in 2012. Individuals in the U.S. use the Tuesday after Thanksgiving to give back to their favorite charities and causes. Giving Tuesday is wildly successful and is one of the biggest fundraising days of the whole year. Events present the perfect opportunity to ask people for donations in person without expending the extra time and resources to meet with donors individually. At your next event, highlight the good work you’re doing and encourage attendees for support. 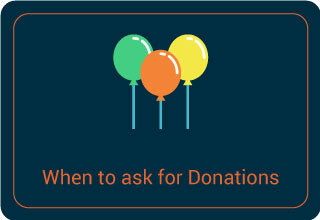 Use fundraising events and other special occasions to ask your donors for contributions. How soon can a nonprofit start fundraising? If your nonprofit is waiting on its 501(c)(3) status, you can still ask for donations. However, those contributions aren’t tax-deductible until you are officially registered as a charitable organization with the IRS. It will be more beneficial to your organization to wait on fundraising activities until you’ve received your 501(c)(3) status from the IRS. Do nonprofits need to register before they start fundraising? Register before you start asking for donations. Register in your home state (state of domicile) first. Register in every state where you fundraise. If you accept online donations, register in New York and Florida (They require registration for any donations made, even if you aren’t actively asking for donations there). If you have an online donation form, register in every state you receive donations from. Your nonprofit can incur penalties and even felony charges for not properly registering. Study the specific requirements for each state you fundraise in. How should we ask for donations? Nonprofits can no longer rely solely on mailed-in donations or cash contributions at events. Multichannel fundraising is now the most common way to ask for donations. How should a nonprofit promote an online donation page? Promote it on the “Ways to Give” page on your website. Include links and information about it in your emails. Post a link on your social media platforms. 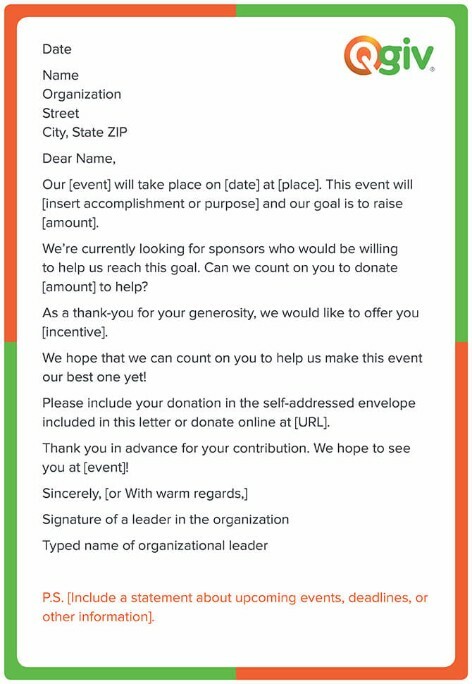 Talk about your online donation page at events. Include the URL in your direct mail materials. Mention it during your in-person meetings and during phone calls. What are the ethics of fundraising? In addition, fundraisers and nonprofits should check their behavior and compare it to the organization’s ethical code. What is an annual fund and why do nonprofits need one? An annual fund used to be known as a fundraising campaign that a nonprofit kicks off at the same time each year. It usually has a theme with coordinating promotional and marketing materials. However, within the scope of multichannel fundraising, an annual fund is now considered to be a nonprofit’s overarching plan or strategy with many components. Your donors establish regular giving patterns. Annual funds provide regular revenue for your organization. Your database becomes more robust. They boost acquisition, retention, and average gift size year over year. How much of a nonprofit's revenue can come from the general public? Public charities must receive at least a third of their fundraising dollars from members of the general public. This means you shouldn’t rely too heavily on donations from your board members or staff. Where can I find financial information about a nonprofit? Look up the annual IRS form 990 on Guidestar’s website. Ask for the past three audited financial reports. Ask for the unaudited year-end financial statements (if audited reports are unavailable). Ask whether the nonprofit has previously received federal grant dollars. How can I give to a charity? Some donors might have reservations about giving online, and that’s understandable. However, most (if not all) nonprofits use donation forms that adhere to the guidelines that are put in place by the Payment Card Industry (known as PCI compliance). These standards ensure that donor data is encrypted and cannot be compromised. Many donation forms will have security logos and certifications to demonstrate their compliance with PCI standards. How can I participate in peer-to-peer fundraising? Peer-to-peer fundraising, also known as crowdfunding or social fundraising, is a way for individuals to get in on the fundraising process. If a nonprofit is hosting a peer-to-peer fundraiser, you can volunteer to be one of the fundraisers. You’ll then create your own fundraising page and share it with your friends, family members, and coworkers. You’ll help raise money for a great cause and participate in a fun fundraiser! Can I claim my charitable contributions on my tax return? As long as you have a donation receipt from the nonprofit, you can claim the donation on your taxes. There are many more stipulations for donation receipts. Will a nonprofit spam me with information? Whenever you give out your personal contact information, you run the risk of getting inundated with direct mail and emails. However, you can also specify your preferred communication channels whenever you donate to a nonprofit. Nonprofits certainly don’t want to drive you away, but they won’t know how often to contact you unless you specify a preference. How can I be sure my donations aren't just going toward salaries? One of the easiest ways to make sure that your donations are being used for specific projects and campaigns is to give to those specific projects and campaigns. Many online donation pages will have an option to donate to a particular facet of the organization or will have a separate donation form for initiatives like events, projects, or campaigns. While you likely won’t be able to track your donation down to the penny, you can talk to staff members and leaders within a nonprofit organization to discuss the best project for your contribution to go toward. 1: Understand that there is a process. Fundraising in all its forms requires a plan, a cohesive team, and a unified asking strategy. 2: Start with your existing connections and move outward. Your staff, volunteers, and existing donors are the ones who care the most about your mission. Start by asking them for donations and then move to their connections. 3: Thoroughly research your donor base. Don’t go into an ask unprepared! Research your donors to determine the right amount to ask for and the right way to ask. 1: Be genuine and authentic. Donors want to give to an organization they can believe in. Communicate your sincerity during the donation appeal. 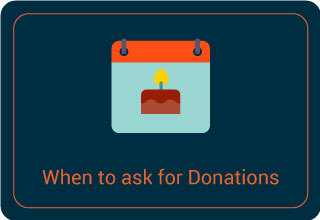 2: Be prepared for something other than a “Yes!” Not everyone is immediately going to want to donate to your cause. Be prepared for No, Maybe, and everything in between. 3: Explain what the funds will go toward. People don’t just throw money at nothing. Tell them why their donations are needed and what they’ll help accomplish. 1: Say thank you more than once. Gratitude is one of the most important components of fundraising. Make sure your donors are aware of your appreciation. 2: Follow up. Give donors examples of what their contributions went toward. Show pictures, tell stories, and give donors a reason to donate again. 3: Offer other opportunities for engagement. Don’t just let your supporters sit in your donor pool. Invite them to events. Encourage them to pursue volunteer opportunities. Engage with them outside of the fundraising appeal. 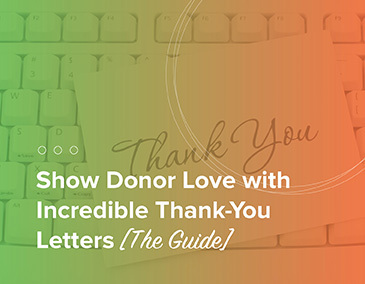 The most basic fundraising letter or email that you’ll write will be for a standard donation. Your letters should differ depending on your relationship with the recipient. Standard donation letters can be used for your year-end fundraising push or during a specific and branded campaign. 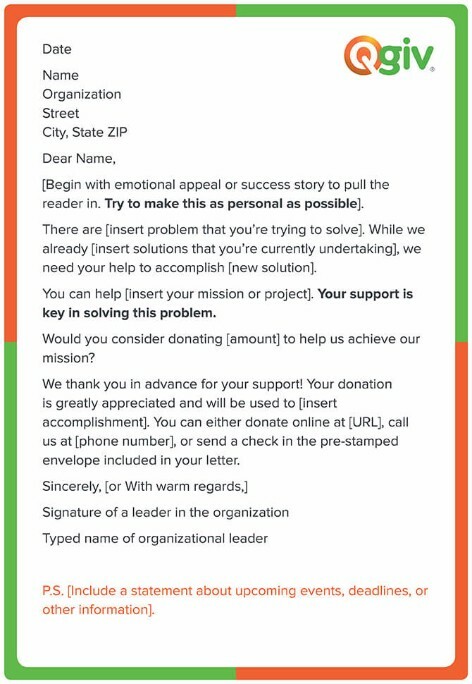 Your standard donation letters and emails should be personalized for each segment of donors, no matter the time of year. Learn more about standard donation letter templates. Many organizations write letters to individuals and businesses requesting sponsorship for a specific event or fundraiser. These letters should explain exactly what the donation or sponsorship will help accomplish. They’re perfect for specific events or fundraisers that require significant backing. Learn more about individual sponsorship templates. Volunteer time letters are requests for donations of time and effort. They are similar to donation request letter and emails. Your volunteers are crucial for your organization’s success. Invite them to work with you by using a letter or email. Your organization can use volunteer request letters at any time during the year. However, they can be most effective in preparation for a designated volunteer day or event. Learn more about volunteer time templates. Corporate donation letters and emails are sent to members of the leadership of local or national businesses. They can also be sent to the designated CSR coordinator at a corporation. Your organization can use corporate donation letters when you’re seeking monetary or in-kind donations from companies. They can be sent at any point in the year, but they are often followed by an in-person meeting or a phone call. Learn more about corporate donation templates. It’s all well and good if your donation form looks great on a computer, but does it function as well on a smartphone or tablet? 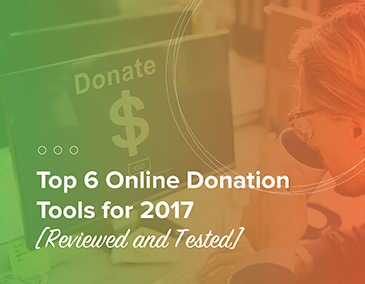 Make sure that your donors aren’t pinching, scrolling, and zooming just to give to your organization. Invest in a mobile-responsive donation page design and start collecting contributions from on-the-go donors. Fundraising events are great ways to interact with donors and raise more money. But most people only have credit and debit cards instead of cash or checks. Use donation kiosks to encourage your credit-card-wielding donors to give at your next fundraising event! 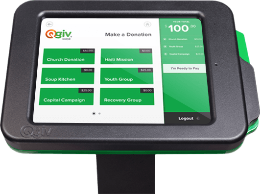 See if donation kiosks are right for your organization. If you’re looking for a way to bring in more revenue and acquire more supporters, you should turn to social fundraising. Also known as social fundraising and crowdfunding, peer-to-peer fundraising takes advantage of your existing donor connections and puts your donors in control of their own fundraising efforts. Check out this info about peer-to-peer fundraising. Text-to-give is only one form of mobile giving. 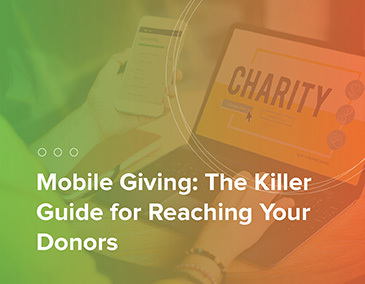 Learn all the ways you can implement mobile giving as part of your fundraising strategy—and why you should! Text giving is an important part of any digital fundraising strategy. Check out our favorite online donation tools to take your fundraising even further. Read our thank-you letter tips! Don’t forget to thank your text-to-give donors! Read our guide to thank-you letters to learn the best practices for showing your appreciation. Asking for donations gets a little bit easier when you have amazing fundraising ideas on your side. Check out our favorites! 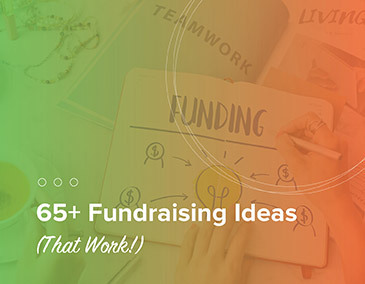 Find your best fundraising idea!